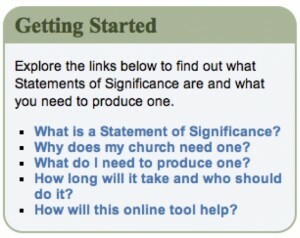 If your church is an old building, or even remotely interesting, then when you propose changes to it you will need to write a Statement of Significance. There have been a variety of attempts to provide guidance on how churches should approach this (including on this site), but the quality of the result is often very poor – at one extreme some churches photocopy a page from an architectural history, or at the other extreme submit an expensively commissioned piece of work by an external consultant. Neither of these delivers an enduringly useful document, one that the church takes ownership of and sees as important in informing their use and care of the building. The root of the problem is that few in the churches can see the point of them. The wonderful Christianity and Culture is hoping to address these deficiencies with a new web-based tool, developed with significant financial support from English Heritage, who see this as a major priority. A workshop took place in mid March to test drive the format and detail of the tool with a real-life example of a church (St Peter’s, Norton on Derwent, outside York), and this post reports on two exciting aspects of the discussion – firstly giving you preview of the tool itself, and why it is such good news for churches with historic buildings, and secondly presenting some thoughts about what the tool could become, which is even more exciting! The first key innovation is that the tool breaks the Statement down into a series of sections, which enables the work to be shared, as different people can be given responsibility for each self-contained element. Furthermore, because it is web-based, the document is always accessible, and can be updated as new information is discovered and as personnel change; it therefore can become a shared point of reference that can be accessed and amended as required. Step 2 – Existing Scheduling and Orders – this is where you put the text of any listing description etc. Step 3 – The Church Setting – a description of the area around the church, both built and natural. Step 4 – Churchyard and Site – the external space that belongs with the church, including any built, natural or archaeological features. Step 5 – The Church Building -Inside – This section allows you to add specific features, including a photograph and a description, to include any important furniture and fittings. Step 6 – The Church Building – Outside – As for step 5, but for the outside of the building. 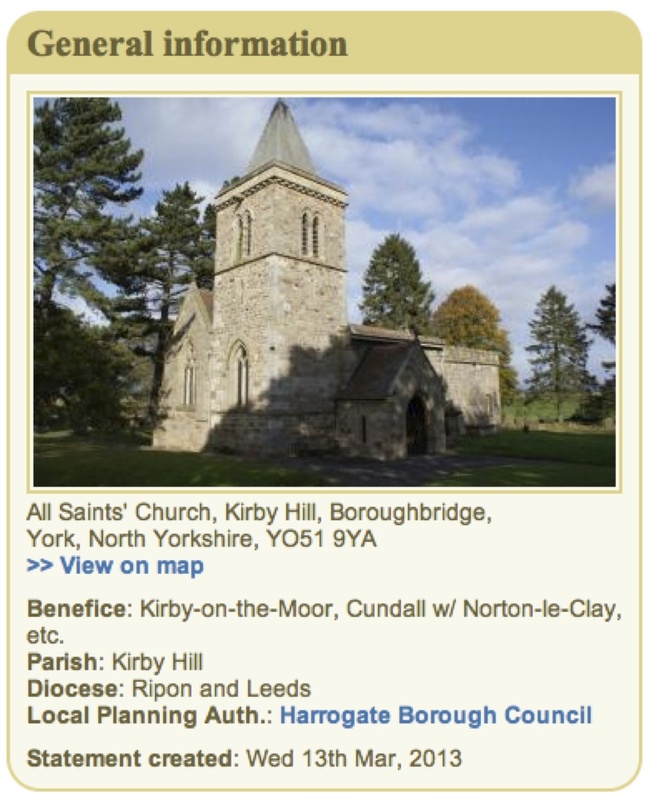 Step 7 – Social History – particular people associated with the church, and community comment and memory. Step 8 – Your Sources – where you got your information from. Each section will be supported by guidance and examples, including images and short videos. This itself will be of great value in helping to clarify the type and extent of information that will be of value. All of this is great, and should help these Statements to become something other than an imposed chore. Having put all the information in, you will then be able to export a formatted pdf document for printing and electronic circulation. It is anticipated that the tool will be launched later this year. If you cannot wait to get your hands on this, and want to contribute to its development you can contact C&C for login details to gain access to the prototype. So far, so very good. But what is really exciting is the prospect of giving broader access to anyone and everyone to view the collected information. This would allow anyone in your local community, or indeed the world, to look at your church, and to get a feel for its character and history. But then imagine what would happen if it became interactive, and we were allowed to leave comments, like a digital visitor’s book. Suddenly the site becomes a community, and mere interest starts to become active involvement. And then what about using the site for recording additional information that comes to light in the process of researching the building? What about oral history, for example the account of the family that was bombed out of their East London home and lived in the church for a week? These personal accounts are gold-dust, for both present and future. Or what about a brief video tour? This material is a really valuable part of the significance of the building, of the narrative of the church in its particular place, yet the audio file would never make it into a Statement of Significance, let alone be publicly available. There is huge public interest in this additional material which is often the part of ‘heritage’ that is easiest for people to engage with, and which tells the building’s story most eloquently. Without doubt these digital visits would in turn drive more physical visits. The ability to contribute, to shape a community around the church, would stimulate interest and potentially give that wider community a role in looking after your building. Which is to be welcomed! And when you did come to propose changes to the building, not only would they be better considered, you would also be able to demonstrate (in most cases) that the church hasn’t always been the way it is now. The commenting facility would also be one valuable means of community consultation, which will give those that must approve your proposals confidence that the community had been given a voice. Imagine if we could use a site like this to build a social history of the community. Imagine if I am sitting in Australia or Canada and were able to upload a photo of my grandmother’s wedding in the church, or of the party held at the Queen’s coronation, or whatever. What makes this so powerful is that it allows the readmission of the broader community to its church. In my view it was one of the greatest crimes of the Victorian age to remove the community uses from our churches, which have therefore come to be seen as the ‘religious club’, to which you either belong or not – in or out – saved or damned. This is a relatively recent aberration; by contrast, the medieval model was much more nuanced, allowing the wider community to engage with the church. The potential here is therefore to turn church buildings into forms of social media. I wouldn’t suggest this is all that a church is or should be, but, if you think about it, this has always been a part of what a healthy church traditionally was. By means of this tool, Statements of Significance, which started out as a misunderstood burden, could become a means of radical re-engagement with the broader community. Bring it on! I had got wind of this, but not the detail. It looks really excellent. It will be essential to add this to our online information/resource hub for rural church buildings; so please keep us posted on developments – especially when links go live. This looks a great project and one that might have applications for other community buildings like village halls.